To that sweet little baby girl in your family, to that sibling you always annoy the heck out of or annoy you so much, here is to that girl that makes you all happy, your baby sister. On her birthday, send her the birthday wishes that you think will make her feel loved, if you are out of words to say or just not good at that kind of thing, here are some quotes to help you out. You are truly the most inspiring person for me, thank you and happy birthday, baby sister. To be honest, you always managed to impress me and surpass my expectations, enjoy! Happy birthday baby sis, thank you for everything that you have taught me in this life. You may but be little but you are nothing to belittle, you are amazing, happy birthday! You have been my shoulder to lean on when things get tough on my side, thanks, baby sis. Sister, I just wish you knew how amazing you truly are, and may you keep on being that. Sometimes life will hit you hard, but a sister will be there for you, enjoy your big day, sis! Happy birthday baby sister, may you get all that you wish for in this life we get to live. You are free to do everything that you want to do, have fun on this day, baby sis, enjoy! Life is a journey and one of the biggest roles is played by a sister, enjoy your special day. Happy birthday to the sister who taught me how to be generous when you have nothing at all! To the most spectacular person in this world to me, happy birthday, baby sister, I love you. You have taught me that expressing one’s self is important, have a great day, my dear sis. 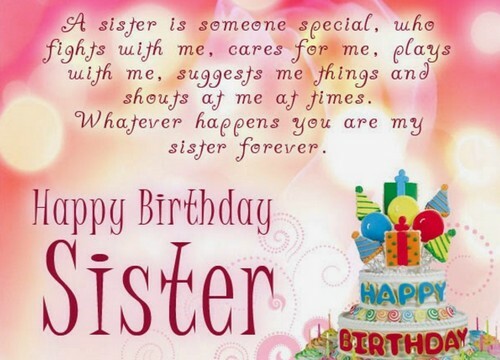 I guess I have to tell you that you are indeed my favorite sister, enjoy today, have a party. You may be the youngest but you are also the prettiest, more years to your life, dear sis! 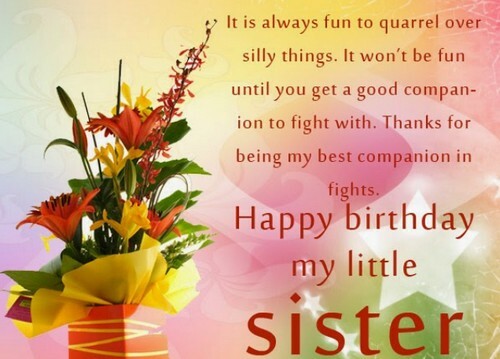 Besides being my sister, you are also my best friend, I wish you all the best for this day. Go out and have some fun, I promise that I will cover for you, I love you, enjoy your day! Baby sis, you may be younger than me but the things you taught me were valuable! From you I have learned what true kindness really means, this is really your day, sis! There is no one who can ever take your place in my heart, enjoy your birthday, baby sis! You have become more than just a sister to me, baby sis, I love you, enjoy your day! I may just be your sister but I am honored to be a relative, enjoy your birthday! Amazing is what you are, baby sis, so may you really and truly have an amazing day! Keep on living the life you have, my dear sister and just have the time of your life today. Enjoy every little thing that matters in your life and treasure them, may you be happy today. You are going to be wonderful today because you are amazing and it is your day, enjoy it! There is no one in this world that will ever amount to you all the best in this day of yours. Every day of the year is very important but today is yours alone so make today memorable. You are made out of sunshine and I can see that this very moment so just love your big day. Baby sis, you are truly amazing, happy birthday to you and may you have a fabulous day. Every day is a good day if I get to spend it together with you, baby sis have the best day! There is no way I am ever going to give up on you, enjoy because it is a good day to celebrate. 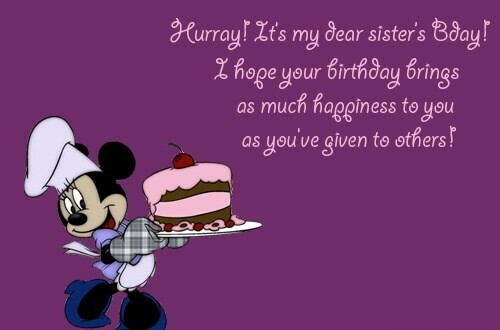 You are the best baby sister I can ever wish for so may you just have an amazing birthday. I miss spending every second with you, baby sis and playing together, today is a lovely day. You are amazing and cool so really, I just hope your day is beautiful like yourself. I tried to throw you the most amazing, fabulous and spectacular party, may you be surprised. Happy birthday, you need to have fun today because you deserve it, baby sister, I love you! 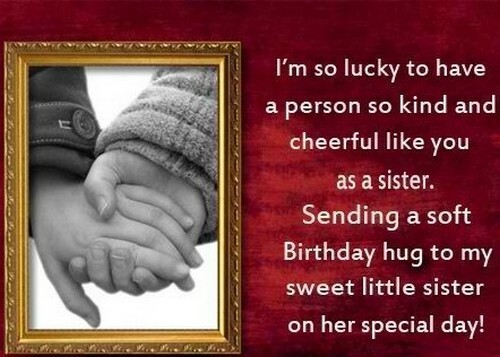 Baby sister, have a birthday that you love and remember I am always here for you, always. You are unique and special and that is why you just have to have a happy birthday, lil sis. You are always full of happiness, like you’ve swallowed the rainbow, have great day! Tell the people you love how you truly feel about them and then just enjoy your birthday! Baby sister, just know that you are amazing and I hope this helps to feel awesome on your day. You got another year at life, another chance to change life so may you find today amusing. Everyone affects everybody else at one point in life so wish you may find today be interesting. We are all barely hanging on thread and you are that for me may you find this day enjoyable. You know my life would be incomplete without you baby sis, may you find your day delightful. How imperfect life would be if you are not here with me, may you have a pleasurable day. Thank you for all the patience you had with me, may you find today entertaining baby sister. You are beautiful inside and out my dear sister so I hope that the turn of events surprise you. 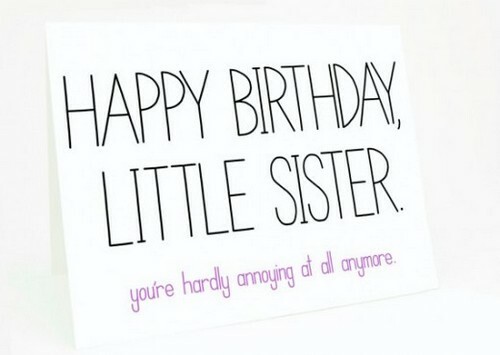 You are my own bottle of antidepressants, my dear baby sister, so just have a blessed birthday. 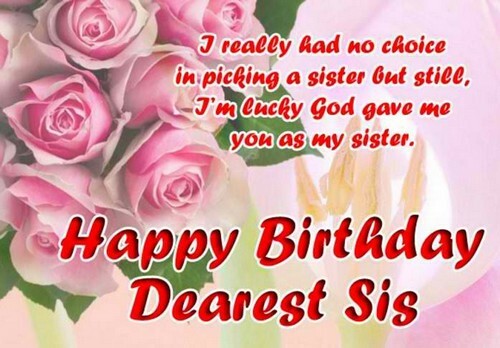 You are but a diamond in the rough, know that and rejoice, just have a happy birthday, sister. 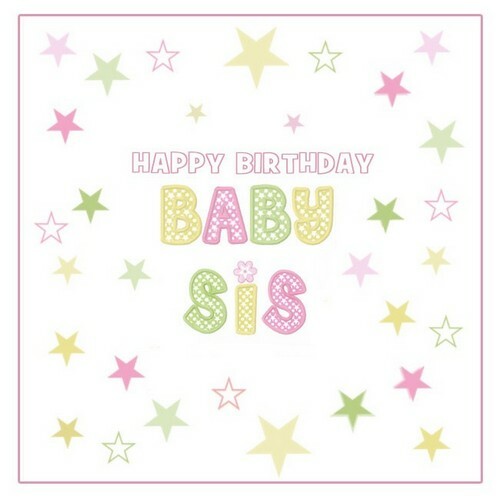 You are one of the most priceless things in my life, my sister so may you have a nice birthday. There is no one that makes me laugh the way you do, baby sis so may you find today satisfying. You only get to celebrate your birthday once a year so may you be grateful for your birthday. There will always be a reason to celebrate your birthday, may you find pleasure in celebrating. No one in this world knows how I feel for you, I hope you do may you feel pleasant today. I always forgive you because I want the sister bond to work out, have a marvelous day today. I asked for a sibling, He gave me you, so for today you must have the first class celebration. You are fabulous and awesome and you deserve to be happy, baby sister. have a grand day! Your birthday is the best thing that I can celebrate now, have the best day of your life, sis. Happy birthday, lil sis, keep in mind that I love you and that I will always be here for you! You are the best baby sister that I know, other girls are jealous of me, have great day! You may be weird and quirky but still I love you the same, may you immense yourself today. You deserve an happy birthday celebration I wish that you get to have some me-time today. Despite all of our differences, we find time to meet halfway, today, take some time off for you! What are sisters but God’s way to assure us that there are good things in each of our lives! Sister, thank you for showing me that nothing is impossible if you work hard for it, enjoy! You are the one who always lifted me up from all of my bad moods, happy birthday, sister! You have saved me in a way that only you can ever save me, happy birthday, baby sister. You are amazing because you are yourself through and true, sis, have a marvelous day today! Thank you for energizing me when I feel out of energy, I love you, baby sis have a grand day! Happy birthday, baby sister, you are my definition of happiness because you make life better. You are the one that makes my wardrobe trendier, happy birthday to you, dear sister! School life is so much better with you by my side, happy birthday, baby sister, I love you! You are this amazing girl and I cannot believe that we are even related, enjoy today, sis. We are like a pair of shoes not meant to be without each other, happy birthday, baby sister. You push away all of my insecurities and that is why I love you, happy birthday baby sister. Thank you for being the person to give me the best memories, baby sister, enjoy today! There are just some competitive people in this world, you are the best, my dearest sister! You have my unconditional love, I love you so much, enjoy this birthday of yours, sister! You are the best person you could have become, happy birthday to you, best wishes, sis! Happy birthday, baby sister, I feel like the richest person alive because I have you with me! No one will ever make me feel the way you do, baby sister, you have to believe it is true! You are the most wonderful person I could have ever met, thank you for being born. You make the world so much colorful than ever, happy birthday and just have fun out there! What a loser you are, you do not ever want to lose, a great birthday is what I want for you. Happy birthday, baby sister, you can do all things you want because you are brave enough to! No matter what happens, I will love you all the same because we are so much alike, sister. Happy birthday baby sis, just keep on being the same person you have always been. I have seen you grow up and I am so proud of what you have become, baby sis, enjoy today. No matter how far I may seem, I will be there for you when you need me, baby sister!